I have seen some boxes etched with design. How does one go about doing this? I saw using laser printer but no instructions as to how to go about it from start to finish. Also did not know where to post this question so this looked like maybe the right spot on the forum to post an off topic question such as this. MarkM has a step by step tutorial. Sweet thanks so much much appreciated. I've got to put a link to that on my site! briggs wrote: I've got to put a link to that on my site! That link won't work anymore.....I pulled it! If you want to host the whole Tutorial, let me know. I have it as a PDF. Last edited by grolschie on 30 Dec 2007, 06:56, edited 1 time in total. But seriously, your tutorial still works. Aron blah blah blah'ed about people not attacking each other, so I reminded him of zvex's sig which is a personal attack on AG and has remained for a long time. Ya know, I was thinking the same thing as I typed that Sig into my profile. I thought that if VEX can do it.....why not? Also, I'm NOT anti-Hendrix by any means, I do have a problem with someones opinions forced upon me which is what happened behind the scenes there. Maybe it's stored in the cache of your computer? Thanks for the support grolschie, I appreciate it. I based my technique entirely on Mark's and logged my first experiences using PICTURE PAPER here. The steps are roughly the same except for the PNP specific caveats. Last edited by grolschie on 30 Dec 2007, 06:55, edited 2 times in total. Why would one pull a tutorial? I don't get it? Because someone might link to it or what? it looks pretty simple, but the result there doesn't look too good imo. I know this could work, but i would appreciate some experienced input. 1. do you find that better results could be had if ferric chloride is allowed to sit longer? 2. any alternative to ferric chloride as an oxidant? 3. what's best as a protectant? Now I only use magazine paper, because it peels off by itself. I use press n peel then apply the etchant to the top side, rather than immersing it upside down. I use an eyedropper to apply to the areas I want to etch, and rinse it every couple of minutes. To keep it from affecting the sides of the enclosure, I just apply tape around the circumference. Works pretty well. Thanks for those photos; they look great btw. I am impressed by the definition you able to get. I saw MarkM's tutorial at diystomboxes so that helped also. do you think it is possible to paint the enclosure with a color of choice and stuff have the ability to etch? That would be the ultimate, but the ferric chloride would probably eat away the paint at the edge huh. So far i have only seen clear coating the sanded enclosure. It looks nice but it is a bit artistically restrictive. Any ideas? I've done (well, my wife actually) done a few different etchings. Used ferric chloride (mixed from granules) in the normal PCB dilution. The first one I(she) used acrylic paint as the blocker, and it worked fine, but after rinsing it cool it off the paint began to bubble, not sure if it was the temperature change or what, but pain (acrylic) is NOT the way to go. She also did some testing with 'liquid hard ground', which is a printmaking blocker, sort of like thin tar. This worked great, but is harder to remove after (you need a solvent). For the last one we(she) did, she did patterns with masking tape, and cut further patterns with an exact. This gave surprisingly clean lines. To get a decent etch I left it in for over an hour, agitating it regularly. The paint one came out after 10-15 mintues due to the paint reaction. The rats one is a rehouse, a boss ce-2 and a bigjam EQ in one. The 2nd one is a 4ms phaseur. I agree about most etchings just being sanded/clear coat. We went a totally different approach since theres alot you can do with printmaking techniques. 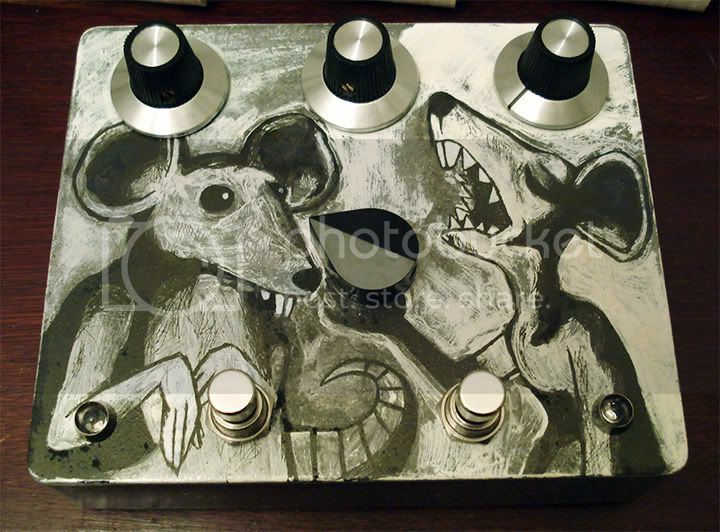 We did some testing (on the baseplats of the rats pedal)doing normal zinc plate techniques, like scraping away the liquid ground with an awl type thing, but those really thin lines didnt work/read well enough to bother. 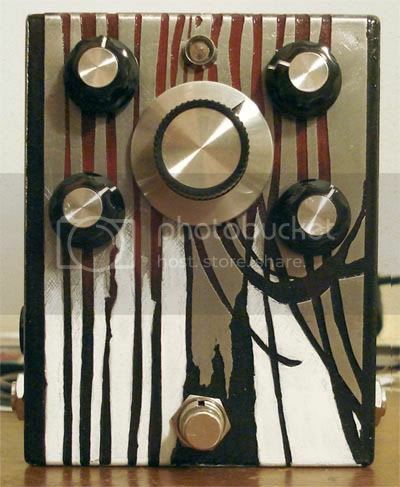 Not sure if it matters, but the rats pedal was a hammond box, and the phaseur is an eddystone. I'm guessing theyre a different alloy of alluminum as they look very different. The hammond box seemed to 'splotch' more in the deeper areas, whereas the edddystone ate evenly/openly. super velcroboy wrote: So far i have only seen clear coating the sanded enclosure. It looks nice but it is a bit artistically restrictive. Any ideas? This is only normal - your etching a design in the aluminium. Covering it with anything but transparant paint will cover your design. But you could apply a transparent colour: I researched some paints in this thread. I didn't try them -- didn't find them available in the EU. But etching is really finding your own way and getting experience how the different factors influence the process. te results that some of you guys have got are incredible. i live in india, ad back then (and to some extent, even now), access to parts, enclosures etc. was limited even in a metropolis like bombay. e.g. you won't find a hammond enclosure, or any knockoff of it - you will probably have to settle fr an electrcal box of some sort. die cdasting is horribly expensive and i would not trust the quality of the finished product. the results aren't worth photographing and posting, but hey, what did i know!? i was a happy camper with my own treble booster! looking at the results you guys have got, i think i'm going to give it another shot.